Thank you for another record-setting year that demonstrated your unwavering commitment to giving. Sending close to $1 billion to charities on your behalf was truly a privilege. We are consistently impressed by the generosity of our donors and by the responsibility you feel to not only give, but to give well.  Recognizing the time and consideration you put into your charitable planning, we took significant steps this year to continue providing information and insights to help you with this important process. For example, last September we launched the GuideStar National Nonprofit Directory, an easy-to-use charitable giving research database that provides in-depth information on more than 2.6 million nonprofit organizations. By adding this tool directly into the granting process online, you can seamlessly research and discover new organizations to fit your desired impacted area. 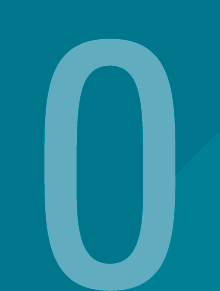 Our donors conduct approximately 15,000 searches for charities every month utilizing the GuideStar tool. We continued to invest in our ability to provide you with quality service, regardless of the business volumes that we experience. This was particularly important at the end of December—when tax reform was announced and our donors were ready to take action.  Although we experienced 70% more phone calls, emails, and inquiries than our prior record year, we were able to serve our donors and nonprofits without issue, and with the same high levels of service you have come to expect from us. As we move forward into a new fiscal year, you are already seeing the additional investments we are making in our business, all of which are designed to make it easier for you to contribute, grant, invest, and involve others in your philanthropy. Thank you for your continued trust in us, your willingness to give feedback, and most of all, your generosity to the nonprofits across this country and beyond that rely on you. 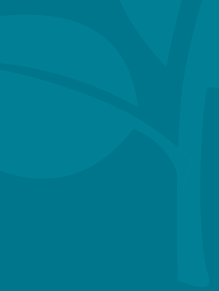 On behalf of your Board of Trustees, it’s my pleasure to write you this annual letter to, first, thank you for your continued confidence in Vanguard Charitable and for the example you’ve set for others with your commitment to strategic philanthropy. We never take either for granted. 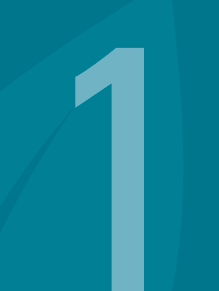 Most importantly, at your recommendation, we granted nearly $1 billion to your favorite charitable entities throughout the country and around the world. That’s our highest total ever and is the ultimate manifestation of our purpose. The Vanguard Charitable team performed exceptionally from a service and operations standpoint during a year that was fraught with unpredictability, especially due to ongoing tax reform discussions in Washington. I have heard from many donors how grateful they are for the responsiveness and guidance they received from our dedicated employees. I have commented often in the past that a core value at Vanguard Charitable is a commitment to continual improvement. In that regard, while working with your Board, our senior team has been sharply focused on how we can continually improve our program for your benefit and that of the organizations we all support. I have never felt better about our business plans, and I know you will sense and see the fruits of their efforts in the years ahead. Again, thank you for your trust and for the example you set for us all. In fiscal year 2018 (FY18), Vanguard Charitable donors achieved a new high in giving, recommending nearly $1 billion in assets to charities across the globe. 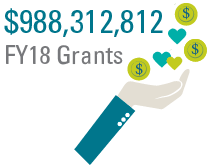 Through your commitment to philanthropy and dedication to the charities you support, you made it possible for organizations to provide crucial services and programs year-round through 108,234 grant recommendations, bringing your total charitable impact to over $7.7 billion since inception. 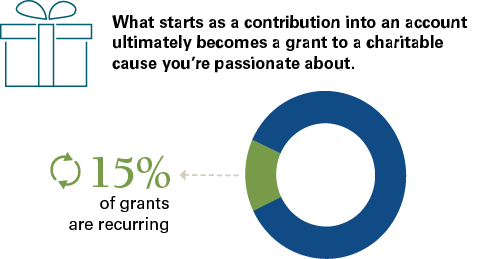 Organizations receiving grants from donors topped 37,000, and one-third of those organizations were first-time grant recipients from Vanguard Charitable. Donors continued to support organizations with unrestricted grants, allowing charities to determine the best use of the funds. Granting with a purpose of “area of most need” provides flexibility to organizations, ensuring they can remain agile while addressing administrative and programmatic needs. Despite year-end tax uncertainties, donors continued contributing into their accounts and investing for growth over time. 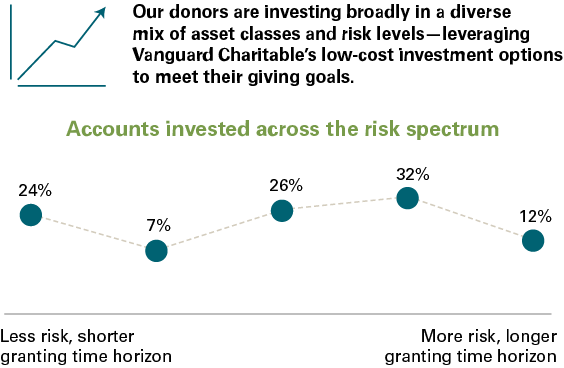 Vanguard Charitable donors believe in the value of a donor-advised fund to achieve their short- and long-term granting goals. In December 2017, we saw the passage of the Tax Cuts and Jobs Act of 2017, a law that significantly impacted the United States tax code. Through our conversations with charities, they are still absorbing how the current changes will impact them and are unsure about what the future will bring. 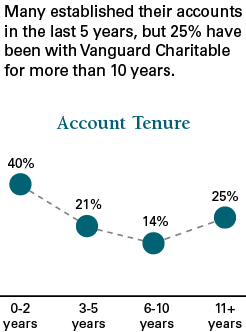 Possibly in reaction to the tax bill and donors’ desires to ‘lock in’ the current benefits of giving, Vanguard Charitable experienced a flurry of activity at the end of 2017, with the number of new accounts increasing110% over the previous year. Earlier this year, Dr. Una Osili, associate dean for research and international programs at the Indiana University Lilly Family School of Philanthropy, joined Vanguard Charitable President Jane Greenfield for a conversation on philanthropy. In the video below, Dr. Osili, a leading expert in philanthropy, spent a few minutes considering the state of philanthropy. As Dr. Osili notes, while the new tax code may affect how much, when, and how donors give, it is unlikely to diminish Americans’ broader interest in supporting their favorite nonprofits. 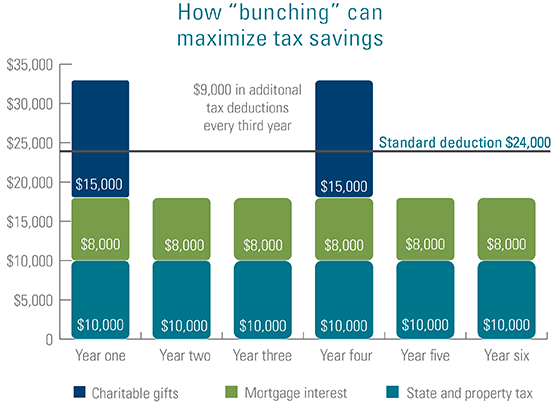 As donors familiarize themselves with the new tax code, they may find that multi-year giving strategies yield benefits. This new approach—known colloquially as “bunching”—may lead to increased giving in a target year and decreased giving in non-target years. Because donor-advised funds allow individuals to make a tax-deductible donation to an account today, grow the proceeds tax-free, and ultimately recommend grants to their favorite charities over time, a Vanguard Charitable account may lend itself well to this strategy. 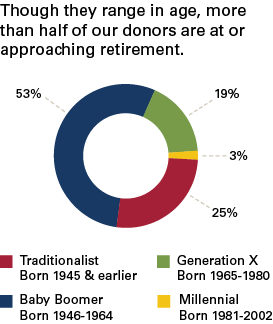 Have you ever wondered how our donors are using their donor-advised fund (DAF) accounts? If they have certain strategies that you could learn from to further your own philanthropy? 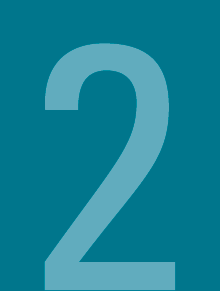 Our Donors’ Journey pulls back the curtain, so to speak, to look at how Vanguard Charitable donors give. 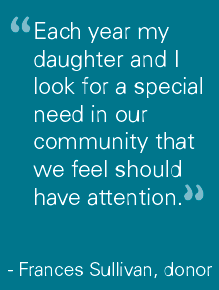 See how Vanguard Charitable donors are leveraging the power of their DAF. How can you think differently about the assets you donate? Are your investment decisions aligned with your granting goals? How could you involve others in your charitable giving? 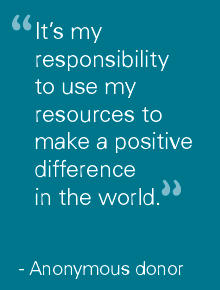 How do you support the organizations you care about? Consider how you are approaching each step on your charitable journey. Explore resources to guide you here. Compilation of giving patterns for accounts during FY2018. Additional data from surveys and market research conducted FY2014 to present. 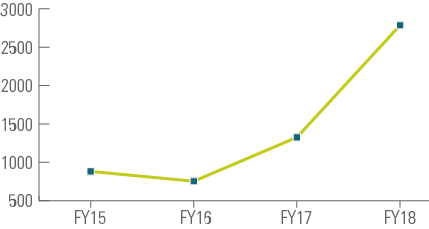 Thanks to the generosity of our donors and strong financial markets, Vanguard Charitable posted another record year, and the financial state of your donor-advised fund sponsoring organization is strong and stable. Donor contributions increased close to 14%, and grants to charitable organizations increased over 30%, demonstrating your continued commitment to fulfilling your charitable goals. We appreciate your continued trust in us to help increase your philanthropy and maximize its impact over time. Vanguard Charitable is on solid financial footing and excited to continue to invest in our business to meet your needs and the needs of the charities you support. 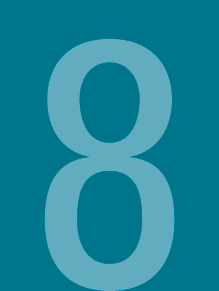 We encourage you to read our full audit report and IRS Form 990 at vanguardcharitable.org/financials.